#RICO20 $4 million NSF grant while Shukla's organization is being "dissolved" ? | Watts Up With That? The updated website says that they’ve been planning to shut down IGES for over two years now. That makes no sense since in October 2013 they were awarded NSF Grant #1338427, which started in May 2014 and is expected to continue into 2017. Does that mean they were planning to shutter the doors while they were still applying for grants? Did they tell the NSF that they planned on shutting down? This award provides continued funding for the Center for Ocean-Land-Atmosphere Studies (COLA). COLA is a climate science research center established to explore, establish and quantify the variability and predictability of Earth’s climate variations on seasonal to decadal time scales, and to harvest this predictability for societally beneficial predictions. The Center is jointly funded by NSF, NOAA and NASA. Work supported through this award includes activities devoted to 1) basic research on predictability on intraseasonal, seasonal, interannual, and decadal timescales; 2) evaluation of the predictability, skill, and fidelity of US national climate models; and 3) contributions to the development of next generation seamless prediction systems. Research performed under item 1 includes testing of land data assimilation schemes in multiple models, performing hindcasts of El Nino/Southern Oscillation (ENSO) events investigate inter-event diversity of ENSO, performing dynamical prediction experiments for the Indian monsoon, and determining the dependence of drought probability on surface boundary conditions including land cover change. Work under item 2 focuses on the use of optimal spatial structures derived from information theoretic analysis, which represent the most predictable modes, or modes for which predictability differs the most between two models. This activity is intended to support climate prediction efforts at US national centers and contribute to COLA’s research-to-operations effort. 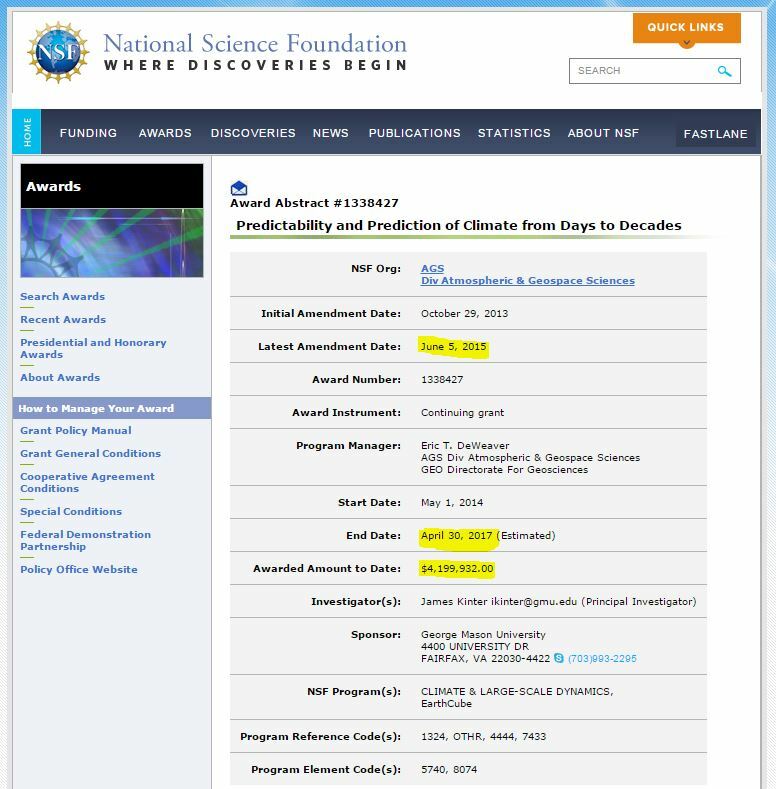 Work under item 3 involves collaborators at the NOAA National Centers for Environmental Prediction (NCEP) and includes the development of optimal methods of initializing high-resolution coupled models including version 2 of the Coupled Forecast System (CFSv2), a model used operationally at NCEP. The work has broader impacts due to its focus on research leading to improved climate prediction, given the substantial societal consequences of climate variability and change. In addition, COLA benefits the US climate research enterprise through community integration, education, seminars, workshops, and software and information services. COLA also serves an important function in transferring the results of basic climate science research on predictability and prediction into operational use. Badger, A. M., and P. A. Dirmeyer. “Climate response to Amazon forest replacement by heterogeneous crop cover.,” Hydrol. Earth Sys. Sci., v.12, 2015, p. 879. With 4 million dollars and counting, good to 2017 according to NSF’s own grant page, the claim of the IGES/COLA website being “decommissioned” just doesn’t make any sense. It doesn’t wash. And, with a web page that still looks like it was designed in 1995, one wonders why Shukla’s clan didn’t put some of that money towards making a decent web page. After all, they only were able to make ONE paper with that 4 million dollars, according to NSF. 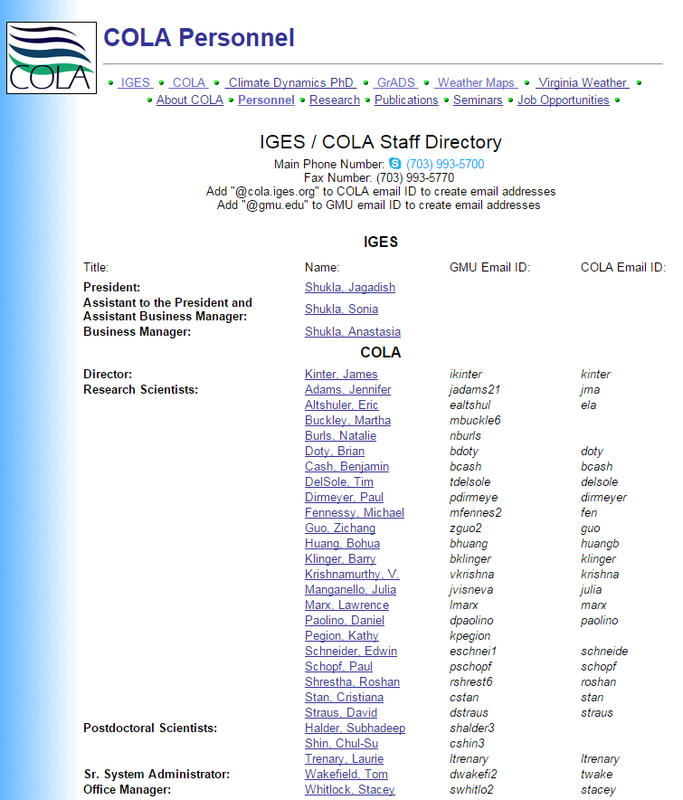 Lest Shukla and associates try to claim that IGES and COLA are somehow separate, their own COLA staff web page puts the issue to rest. COLA appears to be a subset of the Shukla family run IGES. 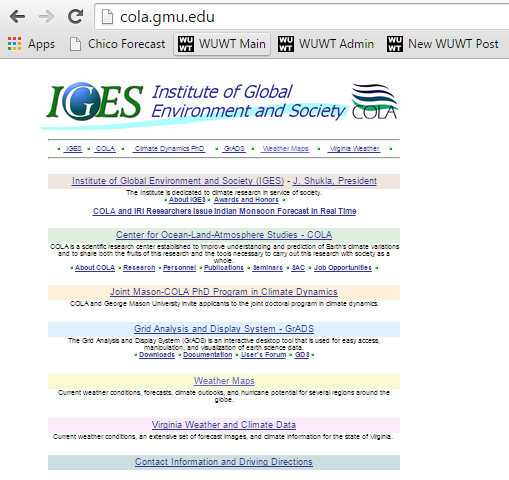 So if the IGES website was going to be “decommissioned”, and so by shutting down IGES, it would seem that would affect COLA too. I can’t find any plans or announcements on their website that says COLA is going to supplant/survive IGES. 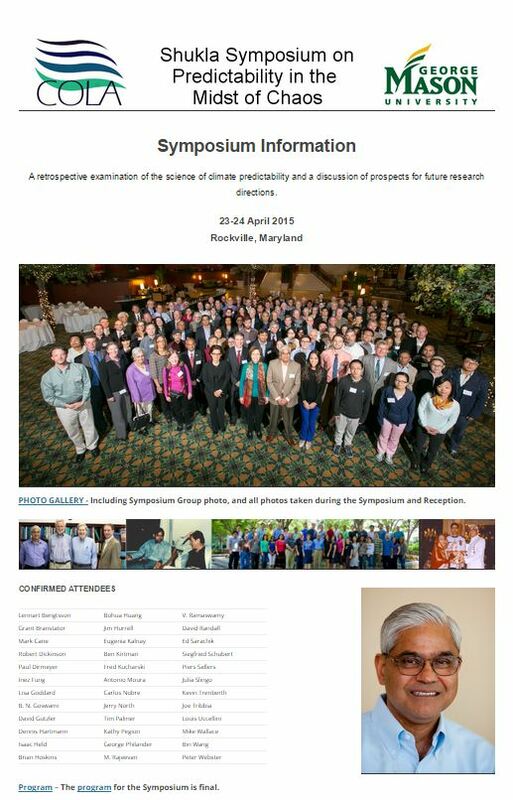 Gosh, a COLA symposium and Shukla’s photo is prominently featured on it? It seems that IGES and COLA are indistinguishable when it comes to Shukla involvement. I wonder if Shukla predicted at that symposium on chaos, the current chaos he’s in the middle of as a result of the now disappeared RICO20 letter? Let’s go back to the claim they uploaded in place of the disappeared RICO20 letter yesterday. If COLA is a subset of IGES, and it appears to be so, with the same people running the outfit, their claim of “all research projects were completed in July 2015” seems more than a bit unbelievable. It also seems unbelievable to me that they’d “decommission” the only website (IGES.org) that represents COLA while it is receiving active NSF grants. Before discussing Shukla’s structure, I’ll first quickly comment on institutional policies, as both the federal agencies (NSF, NOAA, NASA) and the university (George Mason) purport to have policies that prevent double-dipping. Perhaps the Shukla gravy train is about to be derailed once the true accounting is done. Read McIntyre’s excellent piece Shukla’s Gold, the monetary tentacles run deep and wide on this one, and I’m betting there are a lot of people at GMU, NASA, NOAA, and NSF fretting over damage control right about now. Note: within about 10 minutes of publication, this article was edited for a spelling correction and a text formatting correction. How many millions has this Shukla family organization taken from the American Taxpayer? How much of that money did they spend to create the RICO charge against climate skeptics? It even says: ” continuing grant “. How could they possibly plan to shut it down. I think we may have located our first candidate for RICO-shaying ! Well maybe 20 of them anyhow. Well the first thing that scuttles off when you turn the lights on is the cockroaches. And these ones behave just like Madagascar hissing cockroaches. What a sorry bunch. of miscreants. Sorry, he is still a tenured full professor at MIT, and his only cost has been the loss of two small grantsfrom the commonwealth of Massachusetts. Some cost, that. Jonathon Gruber went from being a respected statistician who laid the groundwork for ObamaCare, to being a national disgrace after his contemptuous attitude toward the intelligence of voters came to light. His name became synonymous with government telling obvious lies to dupe the American public (Being “Grubered”. How long before “being Shuklaed” enters the vernacular? T plus two days and counting, by my estimate. Apologies to JCC if he’s now some kind of ‘climate warrior’ in his advanced years. An inquiry will be established by GMU, with all the wrong folks on the panel, and will exonerate the whole lot!! Dare I say, “Carbon” copy of the climate gate whitewashing job. …just like UEA and PSU. Maybe GMU can pull a UVA and hide everything. And Michael Mann will claim it exonerates him too. I think Climate Change rivals Medicare for the amount of fraud. I would like to see a congressional investigation. Seriously? All recent Congressional “investigations” resemble Keystone Cops episodes. You might check into Hillary’s problem to see if the Congressional impact is along the lines of the Keystone cops. Even with all the lying from her and the State Dept., wiping the server clean with a rag, hiding e mails by both parties from FOIA her ratings have dropped like a stone in public opinion, even with unsuccessful cover up by the MSM..
Did anyone say Enron yet? Now that you mention it, Enron was instrumental in getting the climate con running. They wanted to trade carbon credits. The blindness of the Faithful amazes me. Shukla lives in a lavishly funded greehouse and the walls were smashed when he threw the RICO stone. No doubt his Faith includes the expectation that his cronies will circle the wagon; Obama et al. Can’t wait to see where this leads. All that cash!?! That’s it. I’m going over to the dark side. CO2! CO2! We’re all doomed because of CO2! Give me lots of money and I’ll save the world! Eh… I need some practice. This gloom and doom stuff takes a little getting used to, but for that kind of moolah, I’ll get the hang of it sooner or later. Speaking as a US taxpayer… I’d like my money back from this disgraceful family. I am just sick and tired of our government giving away our hard earned wages to stupid causes I don’t support whether that be Iran, Planned Parenthood, illegal immigrants, Tesla, farmers, ADM, windmill operators, Solyndra, or even Big Oil who also benefit from a boat load of stupid and unnecessary subsidies. Is that the “silent majority” I hear screaming? It definitely ain’t the liberals !!!!! Do you mean ” depletion ” allowances; usually referred to as ” depreciation of capital assets ” by ALL ordinary businesses. Yes I do depreciate my Nikon Cameras and Lenses, which are used for several useful purposes both for my lens design ventures, and also for doing experimental studies of illumination patterns produced by various solid state light sources, and their associated (non-imaging) optics peripherals, that I do a lot of design work (patented) on. Which agency or agencies of the Federal or State governments actually have budgets that include monies to be paid to “big oil” to help sustain them for some purpose. Can ” big oil ” buy grocery needs, like wine and beer and T-bone steaks with some sort of corporation EBT card ?? (That’s the ‘ Everybody But Taxpayers ‘ card) ?? Once depletion allowance was accepted by the public as a “subsidy” , its been almost impossible to correct this misconception. The vast majority of the public don’t understand/grasp depletion and depreciation period. And almost a waste of time trying to explain what these terms mean. A shame but that’s the way it is. Big oil pays a very large amount of taxes, in fact in 2013 the 2 US businesses that paid the most taxes were Exxon/Mobil which shelled out $31 billion and Chevron which paid $20 billion. This of course does not include the federal and state revenues from tax at the pump on gasoline, heating oil etc. In fact oil companies get little or no subsidy, Like all businesses they can however offset depreciation of capital assets against income just like Joe’s Corner Doughnut Shop. These grant funded organizations on the other hand are entirely parasitic producing no wealth or incomed but costing you money. The Federal Treasury gleans (like that word) more moolah from ” Big Oil ” than do the share holders of those companies, who after all are the ones who take the risks. Keith, The oil fields themselves ;the source of ALL of the value of ” BO “, are the primary capital assets that they depreciate. It’s called the ” Depletion Allowance ” and ALL finite natural resource exploiting industries and businesses account for that. The whole concept of depletion allowance or ANY depreciation, allowance is for the business to recover (save up) the cost of their assets, IN ORDER TO replace them once they wear out or otherwise disappear. Without depreciation, all businesses would dry up and die. An extreme example of the absolute necessity of depreciation is the semi-conductor industry (think micro-processor chips). When an Intel or other SC company cuts the ribbon on their brand spanking new $100 M wafer fab plant (back in the stone age), it is already obsolete, so the company needs to get cracking on making profits from that plant’s products; because in a couple of years they will have to build a new one, in order to keep on making competitive products to sell, and that new wafer fab is going to cost them $500 M (also stone age) because the technology will have advanced so much further; bigger wafers, smaller geometries, faster memories, bigger, memories, more CPU cores, etc etc. Think ” Moore’s Law “. Today in 2015, there are VERY few companies in the world, with enough money to build a modern competitive semiconductor wafer fab plant. And they can’t recover their cost even from depreciation, so it will take massive capital input from the markets to fund that new fab facility, which now are in the multi billions price range. John Q Citizen, has absolutely no concept of the astronomical pace of development of semi-conductor technology, and the cost of that research and equipment. Only a Conservative government in 2017 will shine a light on this dark horse of corruption !!!! Exactly, but you won’t get it. They will spend quadzillians of dollars to keep the Republicans out and the books closed. Then war is the only answer !!! Eh… are you guys truly blind enough the believe the Republicans are ANY better? Or did I completely miss the sarcasm?? OOOPS !! ” house of corruption ” !!! They will be just as corrupt. I’m old enough to barely remember that allusion. Clever, tho. I am aware of Grant 1338427, which was listed in my spreadsheet. Yes, it involves Shukla and his associates, but it was made to George Mason University, rather than to IGES. Yes, the precise status of COLA is obscure, but that doesn’t warrant getting mixed up on points that are clear. I recommend that this post be totally re-written. If it smells like a fish , acts like a fish and looks like a fish…..it is probably a fish !!! @ Steve I don’t know that anyone accused you of “overlooking something obvious”. I certainly didn’t say that. I will say though, that it is the obscure nature of the whole outfit that raises so many questions. If you have a point of clarification that should be included (beyond the GMU -vs- IGES award point), I’ll certainly welcome your input. I have to wonder, where are the lines drawn here? Thanks Anthony , I was a little confused on his comment !!!! @Steve I was going y this in the NSF award. This award provides continued funding for the Center for Ocean-Land-Atmosphere Studies (COLA). Yet you say it was awarded to GMU. What did I miss? Anthony, in the Sponsor item, it states that the Sponsor is George Mason University, not IGES. This is important and, in response to your question, this is what you “missed”. The reference to COLA doesn’t prove what you think. If you look at all the grants (as I did), you will see that IGES and George Mason both occur as Sponsors. In my analysis, I collated both. I observed that the most recent awards in IGES’ name were in 2009 -2010 and since then all awards have been in the name of George Mason. The award identified in your post was to George Mason, not to IGES. It refers, as you observe, to COLA and – as I observed in my post, George Mason announced that COLA had :joined” GMU, though the precise form of the transaction is somewhat murky. Nonetheless, there are enough issues here that there’s no point making claims that can be refuted, as they will end up being the only ones that you’ll ever hear about. In my opinion – and I’ve looked at the documents far more closely than your reader – Grant 1338427, made to George Mason, not only does not provide evidence that IGES was continuing, but evidence the other way. Now it is possible that grants sponsored by George Mason were funneled to IGES, but we don’t know that based on the present information. Anthony – Steve is correct (but need that even be said?). The grant is clearly to GMU. Just seconding his comment. But it is a tangled web. Agree. Plus GMU had a PR about COLA being ‘transferred’ to GMU, which suggests it was at that time ‘severed’ from IGES. And the 2014 grants are expressly for work by COLA, with Kinter as P.I. I think the kids call it a FWB relationship. I.e., you have “transferred” out of the relationship, but you still, um. work with your ex. I caught that too, Steve. It was to GMU and probably conformed to all of the rules about salary, fringe, and overhead. The 2014 form 990 for IGES reports almost all revenue ($3.8M) to be sourced from “government grants”. So were their auditors simply being sloppy? The same 990 states that IGES makes its governing documents, conflict of interest policy and financial statements available to the public upon request. Perhaps those would shed further light on the subject? That sounds a bit like the circumstances surrounding Willie Soon Yes it involves (insert name here) but it was made to (insert institution here) in that instance it was seen as no defence, why is it different here? Please tell me this self-serving scamming hypocrite tyrant is an author of salacious romance novels as per Rajendra K. Pachauri. Pachauri was also found to be sexually assaulting female analyst. Shoes are dropping on this guy. How many shoes? This Shukla enterprise should be brought to the attention of the President of the George Mason University. I am confident that he would like to satisfy himself that whatever is going on would not stain the reputable university record. JS Please do it then………….. I emailed the George Mason President on September 21. To date I have not had a reply, but then I did not expect to receive one, even though the tone of my message was civil. It would not surprise me if GMU circled the wagons, and protected the source of grant money. The problem with that idea is all of the government money which did not go to research, but to enrich members of a family. Of course they circled the wagons! Those boys got a $4 million heifer in there and mob of wild Indians trying to get at it! Did you never play “Academics and Indians” as a kid? How about bringing it to the attention of the PRESIDENT of the US after all the letter was sent to him. They have someone called Marx and someone called Benjamin Cash. Now they’re just mocking us. LOL…I noticed that too !!! It’s funny, I’ve been reading all these posts about this letter urging Obama to adopt the RICO statute against dissenting voices. And, things seem to be changing by the minute with a few of the signatories; principally Shukla and friends. I came late to this rodeo. Think I need a roadmap. Yes, liberal eco-terrorists like to blur the money trail !!!! It’s raining taxpayer funds. Get some for yourself before they send it all to India. I think you’ll get up-chucked spaghetti before this is over. When do they start issuing stock? It has the growth rate of a fast start up biz. You can only buy stock if you vote for Obama….. for a third time !!! I don’t think we’ll have that option. Voting, that is. Thanks for the work, Anthony. This looks so bad that if it wasn’t for our experience with Climategate I’d expect it to break the Team’s ranks. Riddle me this Batman — Where are all the pitchfork and torch carrying critics who lambasted Willie Soon et al? If Dr. Soon had done what Dr. Shukla has done here, the firestorm would consume several network news broadcasts and half the newspapers in America. The entire world is about to change in a severe way, and it will not be in the direction Agenda 21 had hoped for !!! I’ll be at the front of that. BUT…personal integrity and honesty is worth much more than monetary gain !!!!! But it sure does not spend as easy. More evidence I’m on the wrong side of the issue. I would stay just where you are. It may not be as well ‘compensated’ but I’m not sure that I would want to exchange places with (the) Shukla(s) just now. Just think about the value of a good night’s sleep and you’ll feel better. You aren’t on any side that I can see. You are practicing science based a philosophy of science using objective principles and critically applied reasoning; that is not a side. But there are also philosophies of science based on subjective principles and subjective beliefs /thinking; that is not a side. This is the 2,500++ year old intellectual issue of objective vs subjective thinking, there are no sides but there are significant consequences caused by which approach is implemented. good point. I try to show that there’s another way to look at the data which others aren’t mentioning. Well there you go Dr. Roy. What makes you think there is an issue to be on a side of? What if it makes the sound of one hand clapping ? I’m glad I only design hardware. Every time you turn it on, you know whether you got it right or not. And if not, you might still be able to use it as a door stop. The trouble with doing climate experimental work is that nothing ever happens again, so you only get one shot at it, and then it’s tomorrow. But they seem to spend more of their time changing yesterday’s numbers than they do worrying about correctly getting today’s numbers. This is called “who you know” type grant writing to NSF. Sigh, I guess it is to soon for the government to ask Dr Shukla and crew for their passports. Have they already flown the coop? I believe the Bishop’s expression is ‘snouts in the trough’. What a lovely bunch of grifters. Now, I’d be inclined to think that Dr Shukla is less a leader than a follower, and some spelunking through the rest of the alarmist karst would likely turn up other institutions every bit as dirty as COLA/IGES..
Don’t be silly , only CO2 is dirty !!! I’m gonna be rich !!!! But first I have to puke !! Do we have to first find a way to unlearn everything we know? I think that, even if I made a conscious decision to “go crooked” for the money, I would not be able to actually keep up the façade in daily life. Certainly not in doing research, or writing up a study, or issuing a report. I would stink as a climate con artist. First you must “fool yourself to better fool others”. This scandal perfectly illustrates what I’ve been saying for years. The climate extremists have been getting away with criminal behaviour because they were protected by the press. But as soon as any decent journalists starts digging, because they have been so arrogant about their untouchability , the journalist will find a goldmine of dirt. In Britain it is spelt sceptic! Like we say ‘maths’. And lorry, lift, and my personal favorite…aluminium. Honourable mention for words spelt differently go to colour, flavour, aeroplane, anaethesia, arse, and authorise. I apologise for any mouldy pretence, but the cheque is in the mail. I have to go now, before my savoury supper is spoilt. Glad I own this ‘puter, and do not let it. And its burgled, not burglarized. because they have a much better ” SHOOL ” system. Although this case is odious, I’m not certain it’s appropriate to focus on one man and his family. The attention should be on the entire CAGW gravy train. Cut off one supporting leg at a time !!!! Once he’s been strung up, then you go after the rest. And I have no doubt whatsoever that there’s many more just as guilty. One at a time seems to work better; it’s easier to understand the facts. Interest in “global warming” dropped 87% since 2007. “Climate change” similarly low now. Lack of interest can be interpreted as “nobody gives a damn; bring on the Kardashians.” That is not a good thing. The IEGS IRS Form 990 for 2014 shows (page 7) President Shukla’s “Average hours per week” as “28.0” and his “Reportable compensation from the organization” as “$292,688. ” For Anne Shukla, Business Manager, the Average hours per week are “40” and the Reportable compensation is “$146,045.” Of course, Jagadish Shukla also has a salary from his employment at George Mason University. >>organization taken from the American Taxpayer? And what value for money did the taxpayer receive in return? Or is the offshore bank account feeling well lubricated? Having seen this all too often before, with these ‘close family organisations’, my gut feeling would go with the latter. At this rate he might get invited to joint the Penn State faculty. 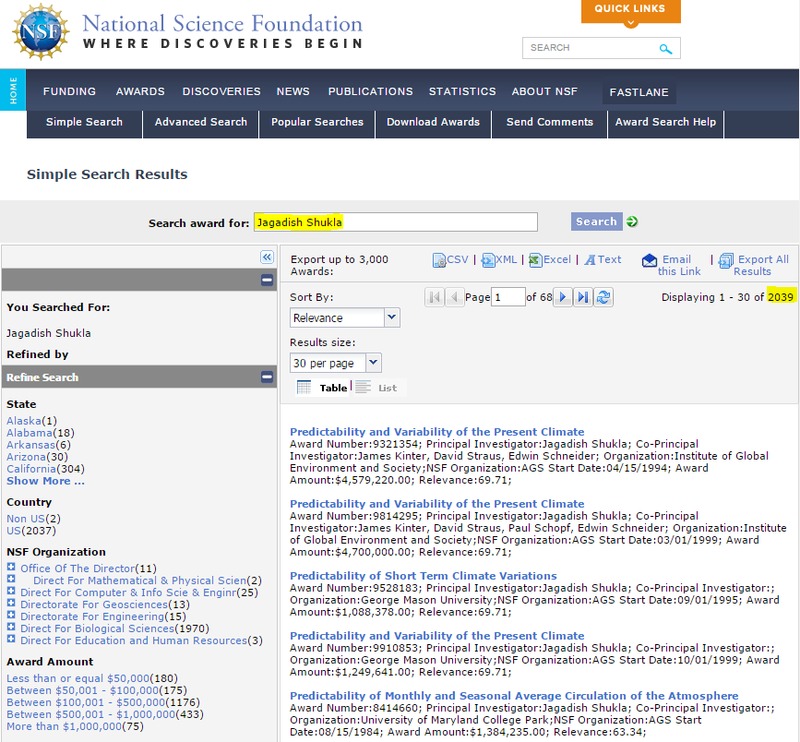 For accuracy’s sake, I looked at the NSF search site and found many fewer grants than the 2039 highlighted above. It appears that the search as done found all instances of “Jagadish” plus “Shukla”. Many of those grants are for Shukla in the biological sciences. When I used the advanced search feature, it returned 12 grants. Correction 21 grants, not 12. Yes, the “2039” figure is ridiculously wrong. I used advanced search and found only 14 NSF grants (checking “active” and “inactive” grants, and also checking for his name as co-PI). There may be other grants that are for the IGES and don’t have Shukla as PI or co-PI, but I didn’t search that way. Anthony, you should probably correct this in the main article. FYI – the IGES being “dissolved” is probably related to the fact that it was previously an independent non-profit institution, but is now an “institute” at George Mason University. COLA is a “center” in the IGES. For universities, “institute” and “center” have very specific meanings (although this varies somewhat from state to state). In my state (North Carolina), a university “institute” must have at least two centers within its organization. And so that is probably why IGES has announced they are creating a new center called CREW (Center for Research on Environment and Water). Before IGES was “dissolved,” some of the grants listed IGES as the primary organization. The most recent ones seem to list GMU. This may be related to the fact that IGES has become an institute within GMU (although it may be that IGES can continue to be listed as the primary organization; I’m not sure about this.) Regardless, it is probably the case that the grants to IGES as an independent organization DID end in 2015, and the ones he received through the university are the ones that are still active. Ted’s interpretation of the transformation of IGES into a GMU Institute is how I see it too. Certainly the apparent machinations reported wouldn’t get through at any university that I’m familiar with: limitations to summer salary, annual required conflict of interest statements etc., with benefits and overhead you end up having to raise about double a researcher’s salary. I know of one faculty member who tried a similar scheme routing applications through a corporation owned by his wife, when it came to light he was fired. One other case was a Small Business research grant where the outside researcher wasn’t doing the work he claimed to do (a whistle-blower reported him), he was prosecuted (I had to give evidence in the case) and he had to repay his funding to the government and was banned from applying for government funding in future. Nice to see that Shukla won the Padma Shri Award from India in 2012, and the Walker Gold Medal from the Indian Metrological Institute. But through using which nation’s money? And I love this article on Breibart about Shukla’s murky oast. Perhaps the MSM media senses blood after all. Arrrroooooooooo !! Its a tough job, clearly, but someone’s got to do it. Which is why Shukla generously rewards its president – himself – with a salary of $330,000 for a 28 hour week and his wife (who works full time) another $166,000. And that is on top of Shukla’s $250,000 salary from the university. Nice work, if you can get it. And these guys complain about ‘big oil’ money influencing Climate Realists !! Note also that in paying himself and his wife $500,000 a year from these grants, there was little or nothing left over to do any research. So what did get done? Or was IGES simply a method of syphoning government grants straight into the Shukla joint bank account? And how much tax was paid on this income? And why did IGES get a charitable tax-free status? I think there are many questions that the tax payer needs answering. congrats & thanx to Steve Mc, Anthony et al on digging into this story. Steve Mc needs to read through that tanlged web. Has Drudge got this yet? I “inadvertently” spill my coffee or forget to put out the garbage. I do not “inadvertently” build a web page, upload it to my web host and publish it. Right there someone clearly posted a lie. I would not want to be a co-signer on any letter with Mr. Shukla. Maybe some of the other 19 would like an opportunity to go on the record that they “inadvertently” signed it. Right about now they’d be awfully worried too many people inadvertently read it. Have any of the RICO20 been involved in producing one of the IPCC’s GCMs? If so, which one(s)? How have the models done? And being paid to be wrong! And you don’t have to produce any results for 30 years; by which time you are ready and wealthy enough to retire. I guess Shukla thinks that the “skeptical community” is dumb, and can easily be put off the trail by a few deft maneuvers. Instead he just manages to sink deeper into the quick sand. Apologize for the mixed metaphor. IGES is listed as a 501(c)3, tax-exempt organization, so I looked at the 990 financial reports filed with the IRS and ran my Non-profit Strategic Profit Model on the organization. Very interesting. By the way, the only reference to COLA in the 990’s is in the compensation section where James Kinter is listed as Director COLA. •	Shows revenue for the year of $3,846,141. Of this $3,832,383 is listed as government grants and $13,646 in publication revenue. •	990’s for 2012 – 14 show total government grant revenue of $11,618,315 for the three years. •	Top 5 employee compensation is $938,366 including $$333,048 for Jugadish Shakla – President, $166,097 for Anne Shakla – Business Manager and $180,038 for James Kinter – Director COLA. The executive compensation is 24.4% of revenue, far larger than what I normally see with nonprofits. o	Total compensation (45 employees) is 78.5% of expenses, with Payroll taxes, IT, occupancy and travel account for 14.9%. o	A single grant for $100,000 is listed as a domestic grant and was made to the Institute for Global Education, Equality of Opportunity and Prosperity (IGEP). The grant is listed as for educational purposes and in South Asia. More on this below. o	The financial statements show assets of almost $327K with $261K in cash and savings, no liabilities and a Fund balance of $327K. This indicates that IGEP is also a 501(c)3, nonprofit and part of the mission statement is to support Gandhi College in the Ballia District of India. There is no compensation for the two listed directors, one of which is Anne Shulka – Secretary. IGEP spends nearly all income on compensation. About 30% to its own “staff” and the rest to others as “program expenses”. It does not appear to do any work itself. Seemingly Iacting as an over compensated pass thru entity. IGEP used $3.8 million in 2014. Next step is to whom were the program expenses paid and what was accomplished for the $2.7 million (estimated) spent. That could be more revealing than the “officer” salaries. Didn’t they/(we) use to call families like this “Mafia”? If you look at the graduate program details it has presentations of the relevant topics which the newcomer to climatology might , as I did, find to be a useful intro . On the other hand if i was an American taxpayer contributing the funds for the research I might wonder why COAL’s technical reports deal so often with weather patterns in India rather than closer to home and i might want to ask Prof Shukla why his 2013-4 submitted and accepted papers deal with that subcontinent almost exclusively. Also known as foreign aid! Are we sure that Shukla also received a faculty salary from GMU? If so, he should be in real serious, as in, checking in at the iron bar hotel, trouble. Most universities regard faculty members as “professional” level employees, which means that they are expected to work however many hours needed to meet the expectations of their position. In other words modern Human Resources Management departments regard faculty as 100% employed by their university, whether they work 40 hr or 80 hr/week. Most universities do have a provision whereby, with permission, faculty members can do some compensated work outside the university, but I don’t know of any university that would ever approve 28 hr/week of outside employment for a full time faculty member. Tenured faculty where I work have been fired for much less unapproved outside earning than this. Does anyone know if Shukla is still at GMU? If so, either he, or the administrators who approved 28 hr/week outside employment (or both) will be in major trouble. Correct. This is very serious. That might result in firing, or even a lawsuit, but how would that be a criminal offense? Misuse of government grant money, on the other hand, has more potential. Agreed, as I posted above. If on an academic year salary you’re usually allowed to earn a summer salary elsewhere equivalent to about 2.5 months of academic salary, which has to be pre-approved. The apparent merging of IGES into GMU might mean there’s a transition period with different rules but I would expect that to require university presidential approval at least. A professor should be able to legally and legitimately receive compensation from different sectors of the University (say, both the geology dept and the center for seidmentology). But the details matter when it comes to compliance with conflict of interest rules and limits on outside compensation. And the details surrounding IGES are as muddy as the Ganges. HI, Phil. Steve McIntyre has posted (in the comments at CA) GMU’s rules on outside employment. He provided a link and quotation; here is part of that quote: “Employees may engage in certain employment outside the university, provided that the employee has obtained prior written approval of his or her supervisor and the employee complies with all relevant University policies, including policies regarding conflicts of interest, and annual leave; and records annual leave when performing outside employment during normal or scheduled working hours. Permission to engage in outside employment must be renewed annually in writing. So apparently he is okay as long as he has his “supervisor’s” permission (presumably, the chair of the department Shukla is a part of). Ted, that’s broadly similar to the rules I’m familiar with, full-time faculty are normally limited to a max of one day a week and as you indicate it’s all subject to approval by department chairman or the Dean of the Faculty. I’m aware of a colleague who was fired for something similar funneling grants through a company nominally run by his wife. The other similar situation is Salby’s problems at the University of Colorado where he was investigated by the NSF for his practice of funding work through his private company in parallel with his university research. While much of this stench is probably true, it’s important not to lose sight of the bigger picture. Shukla was accompanied in the RICO letter by many of his peers in the establishment. It’s a safe bet that all of them are funded by the NSF. That’s the stone under which any investigation must eventually look. Without the cooperation of NSF bureaucrats, this perversion of science could not have occurred. It would be interesting to know how the NSF’s climate budget changed during the extended period of such practices. Likewise for which side of the contentious issue the NSF invested that money (wink.. wink.. nudge). If posting on that site was ‘inadvertent’, just where was it intended to be posted? What’s the big deal. It’s just a cost of living allowance. 20gate + 28gate = 48gate? 48gate has a certain ring to it. The Dirty Four Dozen is not projected to catch-on. When the challenger disaster occurred there was an intensive investigation on how decision making could go so wrong. How could so many smart people, scientists, mangers, engineers ignore what was obvious in hind-site. Or if there was someone who spoke up they were out of hand ignored. One of the outcomes of those studies was the concept of “group-think” which from personal experience is too often alive and well in corporate conference rooms and IT departments. Anyways Climate change is group-think on a massive scale across finance, science, politics, media, and popular culture. If any good comes out of this mess it would be a historical study into how simple observation and reason can became so easily undermined. Maybe such a historical study can reduce the chances of such a disaster from occurring again. Variations of the Earth’s climate affect the entire population and all the societies of the planet. Understanding how and why the climate changes from time to time and place to place on the globe is of central importance to many economic sectors and the social welfare of everyone. Taking the next step by using our growing understanding of climate to make predictions of its variations is the major challenge facing Earth scientists. 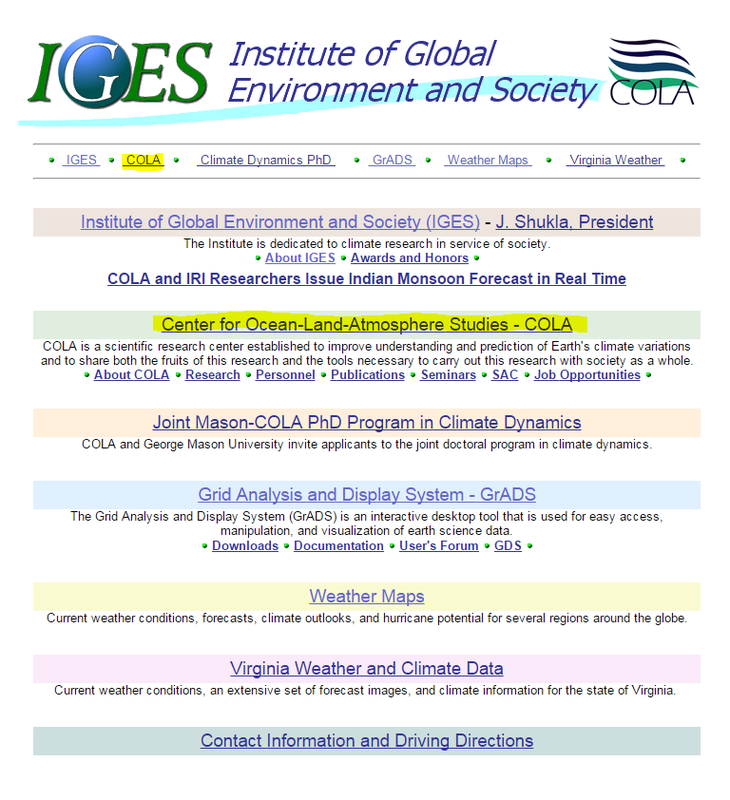 The Institute of Global Environment and Society, Inc. (IGES) – a non-profit, tax exempt research institute, incorporated in the State of Maryland – was established to improve understanding and prediction of the variations of the Earth’s climate through scientific research on climate variability and climate predictability, and to share both the fruits of this research and the tools necessary to carry out this research with society as a whole. The staff of IGES includes a dedicated group of scientists uniquely qualified to conduct basic research in these areas. Application of scientific knowledge for the sustainable development of society is an important objective of the Institute. The Institute has established a center of excellence dedicated to basic research on the Earth’s current climate: the Center for Ocean-Land-Atmosphere Studies (COLA). 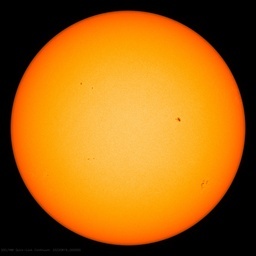 By consolidating several research grants from three different federal agencies (NSF, NOAA and NASA), a single, multi-agency, multi-year research project was developed to create a critical mass of scientists working together as a team at COLA on the basic problem of the predictability of the present climate. With continuing multi-agency support, COLA has become a national center of excellence for research on climate variability and predictability. The goal of COLA research is to explore, establish and quantify the predictability and prediction of seasonal to interannual variability of the present climate through the use of state-of-the-art dynamical coupled ocean-atmosphere general circulation models and the development of new techniques for analysis of observational and model data. Observation: Quantify long-term water cycle trends & variability; enable progression toward a coordinated water cycle observation system; extract knowledge and understanding from diverse observations to enhance prediction capability. Modeling & Prediction: Use multiple state-of-the-art “operational” earth-system models; conduct sensitivity and predictability experiments; infuse process-scale understanding to predict water cycle extremes. Enhance prediction through observational constraints; explore limits of water cycle predictability. There is also an interest at IGES in the application of new scientific insights and emerging climate prediction capabilities to practical problems of sustainable economic development, resource management, and public health and safety. Through the involvement of scientists with the interested stakeholders in these issues of vital importance for society and the environment, IGES transforms scientific research results into information of value for policy guidance and development. The Institute interacts with climate research institutions in the U.S. and throughout the world. Fruitful collaborations have been undertaken with institutes in Brazil, India and Italy as well as with international centers such as the International Research Institute for Climate Prediction and the International Center for Theoretical Physics. When taxpayer funded grants are dished out with enthusiasm, for studies that support man-made global warming, fraudsters will inevitably find a way to take advantage of the situation. This story is the smoking gun of the Global Warming hoax. If you look into the finances of any of the charlatan AGW ”not-for-profits”, you’ll find the same stinking corruption and theft going on. The MO is the same, only the names are different. A quick Google search shows that he owns a home valued at slightly over $1M in Rockville, Md., and another worth ~$400K in West Hollywood, CA. On the surface, this sounds rather lavish, but truthfully neither are necessarily uncommon price points for relatively modest residences in these locations. There is a old trick of setting up a business , such has as builders , making a load of money by ripping people off , then setting up the same type of business with a different name but with all the same people so you can leave the first one with all the problems and debts . What we may be seeing in this case is the academic version of this, given its climate ‘science ‘ with ethical standards so low a snake could not get under them, this is may be a good bet . This guy is a real Ponzi Scheme. Every hook and crook get a Cost Of Living Allowance (COLA). The party never ends (April 2015 shindig). George Mason is also home to Prof. Edward Wegman (of Wegman Report fame). When a FOIA was presented to the University regarding Prof. Wegman’s correspondence, GMU and Wegman (unlike UVA and Mann) responded with the materials. Prof. Wegman was accused of many things, even including misallocation of federal grants. Prof. Shukla may eventually join him in the unpleasant business of justifying every grant, every email and every public statement he has ever uttered. But it will be interesting to see how George Mason responds to the inevitable FOIAs that will seek to shine light on the questions raised by Prof. Shukla’s “inadvertantly” official advocacy and University funding entanglements with Shukla family-run businesses. Typo: I inadvertently misspelled inadvertently. Be careful what you wish for… http://www.nature.com/news/2008/080514/full/453268a.html They say they want a revolution: Climate scientists call for major new modelling facility. Actually, “modelling” is the correct British spelling; “modeling” is American. Is this letter from Congress to IGES for real?